Where generator sets are fitted within containers, DAMPERS may be required to provide controlled airflow through the container. 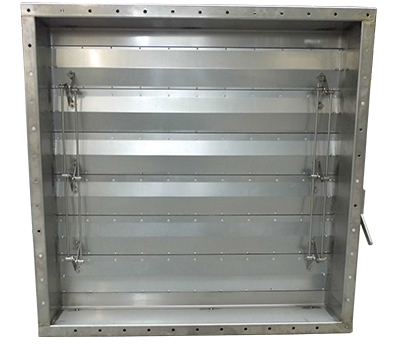 These DAMPERS may need to be mounted within the container, on the ends of the container or integrated into doors of the container. DUCT ENGINEERING can manufacture DAMPERS to suit any of these installation types. ACTUATORS can be mounted 'inboard' whereby they can be enclosed within a central box section with removable covers to allow easy access for commissioning and maintenance. DAMPERS can be supplied unsealed or sealed to BS EN 1751:1999 CLASS C3 (Tested by BSRIA) and fitted with pneumatic or electric ACTUATORS including actuators suitable for hazardous areas.